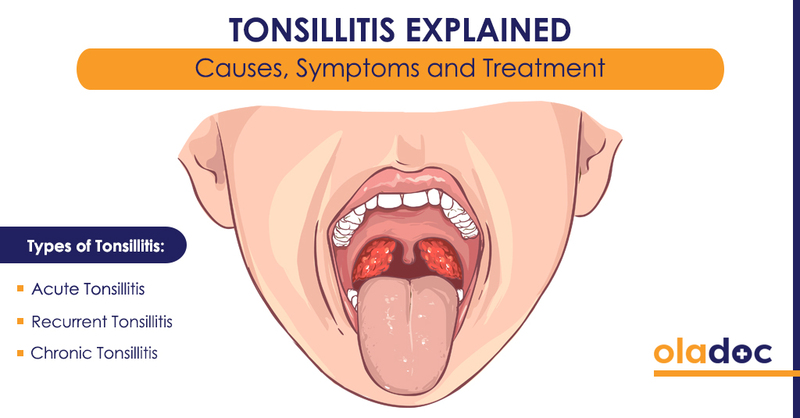 Tonsillitis is the inflammation of, usually, the palatine tonsils, which get infected by various viruses or bacteria while fighting them as part of the initial immune system defense. Since tonsils are most active during earlier years, tonsillitis usually affects children between the ages of 3-15, though adults might also contract the infection in some cases. Cases can range from mild-a little worse than a sore throat-to severe. Acute Tonsillitis: 3-4 day symptom-lasting period, which may extend up to 2 weeks. Recurrent Tonsillitis: Multiple acute tonsillitis infections in a year or over 3 years. Chronic Tonsillitis: Symptoms are more severe and long lasting than acute tonsillitis and may also include bad breath, tender lymph nodes in the neck and chronic sore throat. Tonsillitis is most commonly caused by viral infections, usually the ‘cold’ or Influenza virus. Other viruses that may infect the tonsils include the Epstein-Barr virus-which is also responsible for glandular fever-the Rubeola or measles virus, Enteroviruses and the Cytomegalovirus. If infected by the Epstein-Barr virus for the first time, the resultant tonsillitis is contagious. Moreover, around 15-30% cases of tonsillitis are caused by bacteria, with the common culprit being the strep throat-causing bacterium, A Beta-hemolytic Streptococcus (GABHS). In rare cases, infection might be caused by fungi or parasites, particularly in people with weakened immune systems. Bacterial tonsillitis is highly contagious. Like a cold or flu, tonsillitis is usually spread by coming into close contact with an infected person; either breathing in infectious cough or sneeze droplets or touching the eyes, nose or mouth with droplet infected objects or skin. Temperature higher than 38 C.
Sneezing, coughing and a runny and stuffy nose along with any or all of the above symptoms might indicate viral tonsillitis whereas as a sore throat, severe fever and swollen lymph nodes minus common cold symptoms signal bacterial tonsillitis. While tonsillitis is self-cured in 7-10 days, bacteria-caused tonsillitis requires treatment via a full course prescription of anti-biotics in order to avoid recurrence and reduce the chances of developing rheumatic fever or kidney disease. Surgical removal of tonsils (tonsillectomy and adenoidectomy), once common procedures, are now only reserved for extreme cases. *Note that giving ibuprofen to younger children is highly discouraged. Tonsillitis is rarely a cause for concern. However, if you suspect a severe infection, do not hesitate to book an appointment with a top ENT Specialist in Lahore, Karachi and Islamabad through oladoc.com. Or call our helpline at 042-3890-0939 for assistance to find the RIGHT Doctor for your tonsil troubles.